I know my friends with booths and online stores are always looking for ideas so, this might be something to keep in mind. If only there was a vintage bottle store, but there is no such thing so..... Keep your eyes open at thrift and estate sales, you'll find them! The secret ingredient is Water slide decals, the tutorial is Here. The decals and the way you pretty up the bottles are charming and romantic and I can see why people are snapping them up at your outlet. You rock these Carol.I really love the look, and your cute embellishments add a nice touch too. wow, they look great, I love the decals , they really are vintage looking. I must revel once more in your awesomeness! Beautiful as usual. I want some of those decals, so I will be visiting your store soon. Have a great day. These are oooooh and ahhhhhhh worthy! Pretty perfection! The colors are spot on for soft and pretty! These are so beautiful! Love the design and embellishments. I always find so much inspiration every time I come here. 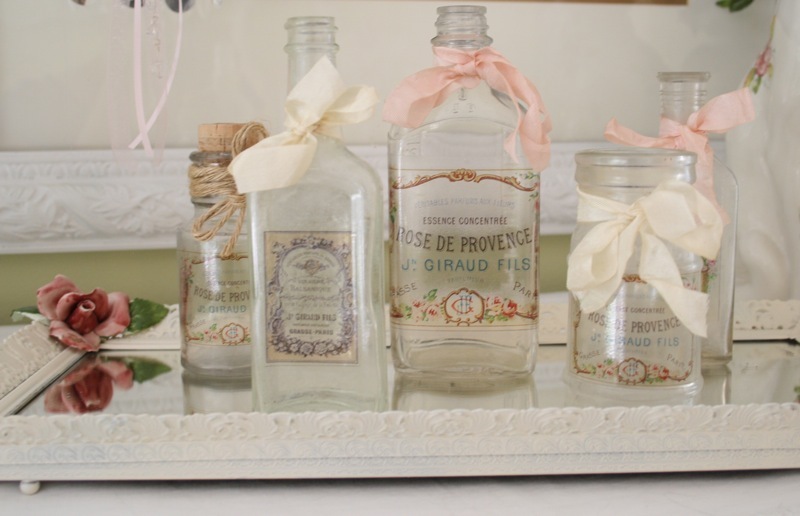 Your vintage bottles look amazing! I could use a hot sell item in my booth. I've had a good month so far but I'd love to have something like these. I might give it a try. They are so pretty and I can see why they sell fast. These are beautiful...I have no doubt that they're selling like hotcakes for you! I love that your selling the decals all ready to go too. Your bottles are beautifully done. No wonder they sell so well! I guess I'll have to wait till next time to buy your decals. I saved your tutorial so I do it just right! Okay - those are soooooooooo pretty!!!! I love them - what FUN!!! I am so not surprised these sold out! Oo I love the decals on the bottles! You inspired me with your last decal post that I actually blogged about it a few posts back. Your bottles are so beautiful! I didn't even get all the way through your post before I went to your shop. I'm happy to find out that you will have more....they're so pretty. The bottles are beautiful....I'm not surprised they are such a big seller!! Thanks for being so generous with all your info! Another wonderful project that you have shared with us!! I love what you do to them with the decals, too. Hi Carol, Oh these are so pretty and you are a girl after my own heart. 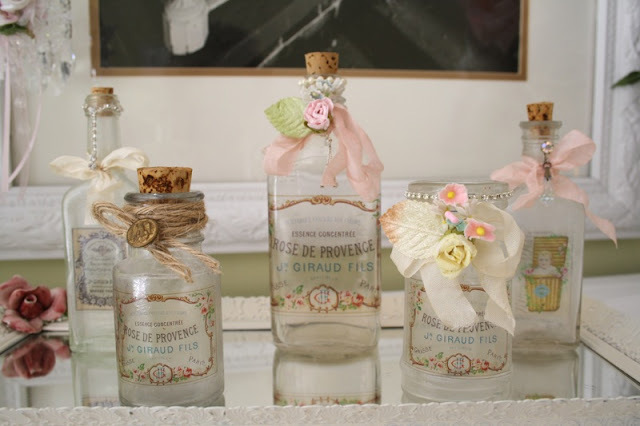 I have these same vintage labels and been using them for awhile on lots of treasures including bottles. I found many great vintage bottles to redesign here at one of my favorite antique malls. Love your pretties!! Also, I passed on your home tour post to my friend who is going to move to the Orlando area. She went crazy for your lovely home and was interested in the paint colors on your walls. Especially the green shade. She asked me to find out from you if possible the color name you used. If you can share that, she would be so thankful. Have a happy creative day. OMG! Just what I was looking for! In fact yesterday I found instructions on using Modge Podge and then rubbing the paper off...looked like a lot of work. This looks easy! Thank you! I have a ton of glass bottles and clay pots etc. Now, I can re-purpose, re-use or re-sell! You are so talented and giving of yourself. Thank you, Carol! These are just beautiful, Carol. I'll wait for your online store to get restocked ;). I have yet to try the slip decals. Oh fooey...I really wanted to try them...I didn't get here fast enough!! 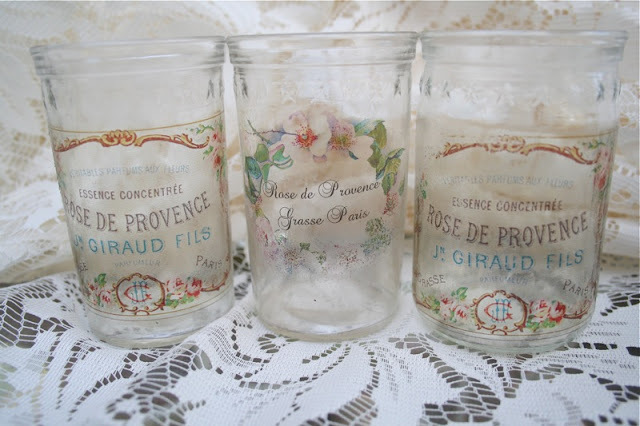 Your jars are adorable. It's good to know what's selling in other parts of the country and what they are selling for...thank you for being so open about what you do and what you sell. I'm the same way about my online store...don't promote it like I should. I love your decal! hope you soon have more for sale! pretty, carol! thank you for the comment you left on my blog feature. so appreciate it! Hi Carol. I didn't know you were selling your decals. I would love to purchase a couple of sheets from you when you re-stock. My experience with making them a couple years ago was not a pleasant one, hence I made no more! These are so very beautiful! Love your online shop! Thank you for sharing! OH MY GOSH! Fabulous girly! Fabulous. Love them all! Now...your comment on our laundry room redo made me smile. But you calling my hubbs and I kids took me to the moon! LOVE LOVE LOVE the bottles!!!! These are so darling and you are just SO CREATIVE!!! :) No wonder these sell like hotcakes they're stunning!!! The bottles are so beautiful!!! CLASSY, just like you Carol. I was instantly addicted to the waterslides. I showed them to my husband and he said, "oh, those are like the decals I use on my model cars/planes." These botles are truly lovely. can't wait to try this process. Thanks for sharing. Carol, I love the bottle! I was wondering if you had any tips for cleaning the inside of old bottles? The old ones always seem to be so mucky inside. Soaking them in soapy water doesn't always seem to help. 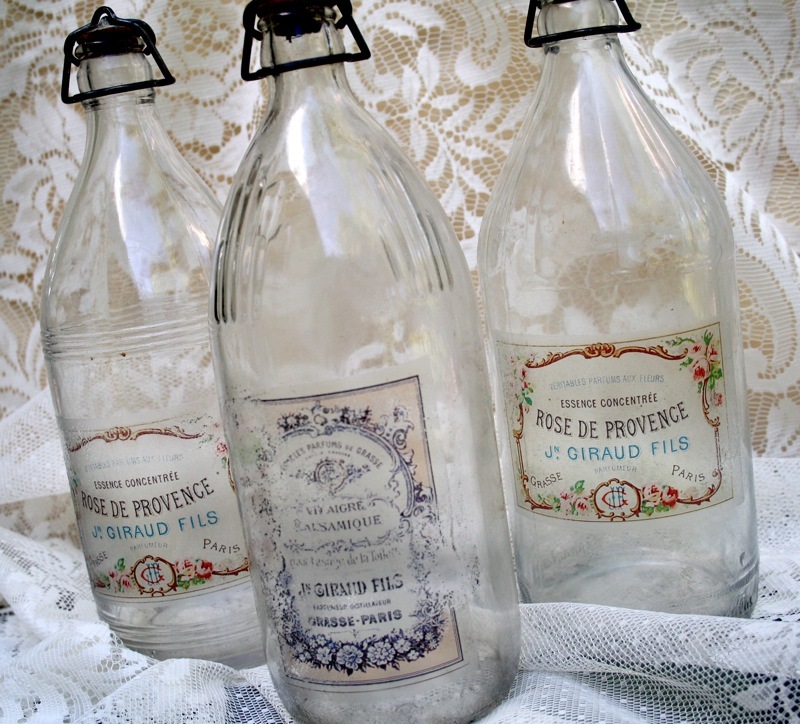 Loved your gorgeous vintage bottles. Thanks so much for linking them, they are now a feature this week at WIW. Come on by and grab a button! ohhhh, I love all of your bottles! sooo pretty and girly! Love your vintage bottles. I have an historic home and am always looking for little touchs. Thanks for the tutorial and for selling the decals. It's generous of you to give us a choice. I like that! LOVE them! 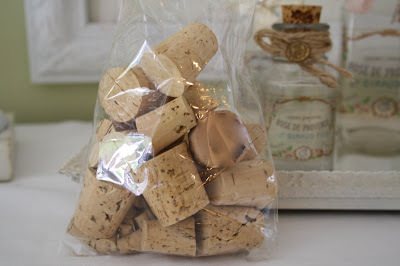 You'll be featured later today, along with the winner of my giveaway for That's the Ticket Blog Hop Link Party! Thanks so much for sharing at the party! There will be a button there waiting for you! Love your hats. The embellishments are spectacular. The bottles are so cute also. Love it. Thanks so much for helping me on my hat project with information.